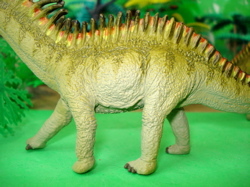 Amargasaurus is the porcupine of Dinosaur toys. 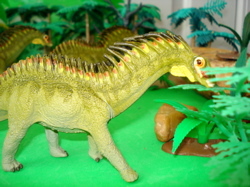 The Carnegie Amargasaurus is a of one of the smaller ("small" being a relative term) Sauropods. Considered to be one of the least intelligent of the Dinosaurs it was smart enough to survive for five or six million years in basically the same form. The original creature was approximately thirty-three feet long (10 meters) and six tons. Compare that to the Diplodocus (a near relative) at ninety feet and fifteen tons or Apatosaurus at seventy-five and perhaps forty tons. Thus the Amargasaur qualifies as "small". No one knows the purpose (if any) of the spines that ran from just behind its horsey looking head to perhaps two thirds of the way down its tail. Perhaps the purpose was to enhance its chances of becoming a Dinosaur toy sometime down the road. 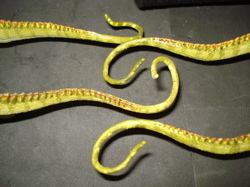 The tail itself was thin and whip-like, approximately one half of its total length, and may very well have been useful as a defensive weapon. The Carnegie Collection (opens new window) has presented us with a beautiful little replica that, itself, may last several million years. The little information booklet that comes with each (new) figure will likely not last as long as the Dinosaur toys themselves. This little guy weighs in at a solid two (2) ounces (55 gms) and is ten (10) inches (25.5 cms) from horsey nose to whip-tail tip. It is 1/40 scale as are most of the Carnegie Collection. 2006 saw the introduction of this figure it and makes a great addition to the line. It is very unique looking with a very nice race-horse look about it. It is not a plodder but an active and dynamic figure. The Amargasaurus, overall, is done in shades of olive green with the spines done in a combination of yellow, red and a much darker green. Making for a striking appearance. giving these Dinosaur toys a very bright personality. Each is individually hand painted by a highly skilled (skill level varies) and trained Chinese artiste and so each is slightly different from all the rest and unique unto itself. The differences from one to the next can be seen below in both heads and tails. 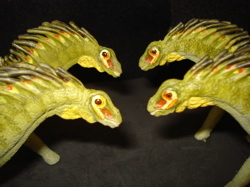 Due to the imperfections in mass production techniques for these Dinosaur toys even the tails are slightly different, one from the next. A very good looking member of the Dinosaur toys family. Interestingly enough the Amargasaurus is known from a single individual's skeleton. And that incomplete. I am constantly amazed at the way modern paleontologists can create an entire creature by extrapolation. As our little herd is on the move they are beset by a pair of Carnegie Albertosaurs who are determined to make a meal of them. But coming in from behind is problematic due to the whip-like tail and our herd makes its escape, climbing from the lowlands where they winter to higher plains for their Summer vacation. Produced by Safari Ltd. (opens new window) for their Carnegie collection I would like to offer the site's personal thanks for their contribution of our herd at this time. while a bug's eye view (below) shows us both the very nice lines and the well crafted feets. Including the large inner claw on the front feet, another item with purpose unknown. The feet themselves were broad, with five toes, not well delineated, particularly from this viewpoint. The belly in the above close-up shows the imprint which lacks the official "The Carnegie" or any other notation that this is part of the collection. But it is. Strange. 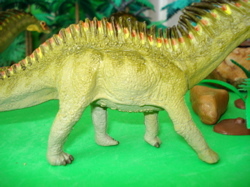 Having been introduced in 2006 these Amargasaurus are still in active production and are readily obtained at local toy stores that carry Safari Ltd. products. They are also available on the Safari Ltd. website (opens new window) and from other retailers at prices ranging from $6.83 to $9.99, not including shipping. On eBay prices range from $5.75 to $12.49 for new. I found none used. 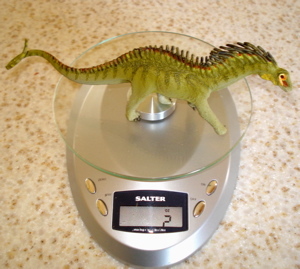 I suppose that if you were to search through 'dinosaur toys' you might come upon one as part of a lot. But why bother? Being made of some kind of rubber these Amargasaurus are quite rugged and will stand up, pretty much forever to all but destructive "play." Safari guarantees them to pthalate and other 'toxins' free and you can read the reports for the mandatory guv'mint testing they have to undergo before they can be imported and sold in the USA. They also have the European Union -CE- seal of approval. They have passed their safety tests with flying olive green colors and will make excellent additions to anyone's Dinosaur toys herd, toy box or collection. They also look good on a desk, take up very little room and do not demand, so much as draw, attention. I like this figure very much and it is currently the best (most realistic!?!) 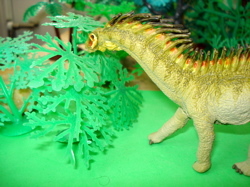 Amargasaurus figure in production. 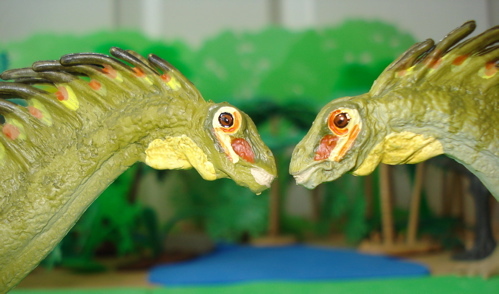 We hope that you have enjoyed reading about the Carnegie Amargasaurus and will go to our Sauropods page to discover other friends of the Dinosaur toys persuasion.